The Drysdale Community Foundation recognized Open Heart Kitchen with a grant award at their annual company meeting in February at the Lesher Center in Walnut Creek, California. Real estate agent Lois Cox nominated Open Heart Kitchen. Our Executive Director Heather Greaux discusses with Lois Cox why it’s so critical to provide food and shelter resources to those in need. Heather Greaux: Thank you Lois for making this happen! Can you tell us why you chose to nominate Open Heart Kitchen? Lois Cox: The reason I nominated Open Heart Kitchen to receive a Berkshire Hathaway HomeServices Grant is because of all the people and families they feed in the Tri Valley Area. The cost of living in our community is rising which is affecting many families, our veterans and our seniors. I was shocked to find out how many people in the Tri-Valley go hungry and just don’t know where their next meal will come from. Many residents have to make the tough choice of paying for food or paying for rent, utilities and medicine. It is all essential to live. Open Heart Kitchen provides hot meals and even a weekend bag lunch program to those in need. Open Heart kitchen also provides opportunities for volunteer work for adults and students. Volunteers help with meal service, prep work and kitchen work; by using volunteers for these jobs, it helps stretch the funds provided by grants and county programs. Heather Greaux: Volunteers are definitely a tremendous resource for Open Heart Kitchen, as are grants. How does the foundation determine the grants that are awarded? Lois Cox: Berkshire Hathaway HomeServices Drysdale properties has always had a strong commitment to giving back to the communities we are in. A significant part of that commitment is the Drysdale Community Foundation. The foundation is run and directed by our selling agents, not by the management team. The foundation is funded solely by the contributions of agents. At the close of each home sale agents are asked to make a minimum commitment of $10. Many agents give much more per closed home sale. All these funds are collected throughout the year. Each fall agents are asked to nominate local organizations that would benefit from a cash grant. I was happy to nominate Open Heart Kitchen! The grants are awarded on our Annual Day of Gratitude in February. Since 2013, BHHS agents have given back nearly $258,000 in grants. 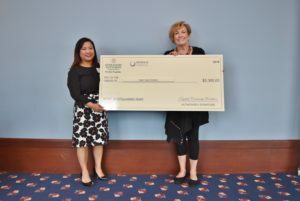 This year over $80,000 in grants were awarded to 15 deserving non-profits in California and Nevada. Open Heart Kitchen is a 501(c)(3) charitable organization.